Over/Under: Under 155.0 at 1.90 Bet Now! There’s another Istanbul derby in the Euroleague this week as the second leg of the double-header action takes place. Fenerbahce lost in the earlier game this week but they secured their playoff spot when one of the chasing teams outside of the zone lost. That takes some of the pressure off of the away side in this game but that pressure is still very much on the hosts. Anadolu are looking good but they have to get over the line, so they need to see this game as an opportunity to book their place in the next stage of the Euroleague tournament. 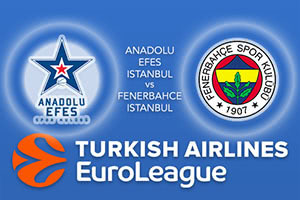 This game should also be seen as a chance for Anadolu to get some revenge on Fenerbahce. The two teams are very familiar enemies in domestic basketball but they have met on seven occasions in European action and Fenerbahce have won every single time. Turning a 0-7 record into a 1-7 record may not seem like a massive step forward but it is something that Anadolu will be desperate to do this midweek. In the previous Euroleague clash between these sides, Fenerbahce came out on top by a score of 88-80. There was a big showing from Kostas Sloukas, who offered 21 points that night, but he is currently injured and won’t be able to have an impact on this game. Efes have been in fine form of late, winning six of their seven most recent games, and Thomas Heurtel has been in fine form this season, offering an average of 13.3 points per game. There has also been support from Derrick Brown, who has provided an average of 13.2 points per game and Bryant Dunston has chipped in with 10.4 points per game. It looks as though Fenerbahce will be without Luigi Datome and Bogdan Bogdanovic through injuries which means that Ekpe Udoh will be required to lead the line, and Udoh has offered an average of 12.3 points per game so far this season. Bobby Dixon has also offered an average of 11.1 points per game so there are players that can assist Fenerbahce get through this game. Back Anadolu Efes Istanbul at -4.5, which is provided at odds of 1.90. If you’re looking for the Over/Under market, go UNDER 155.0 at odds of 1.90.